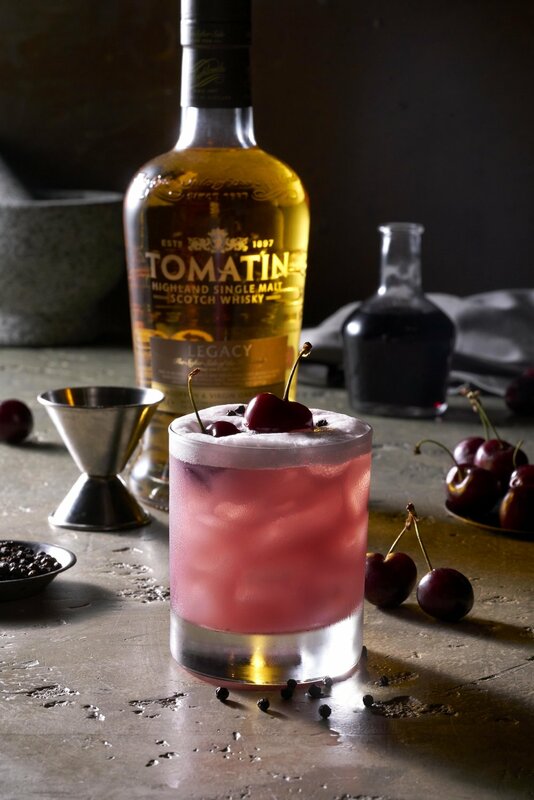 TOMATIN LEGACY WITH CHERRY SYRUP & BLACK PEPPER MAKES FOR A SUMPTUOUS TAKE ON THE CLASSIC WHISKY SOUR. 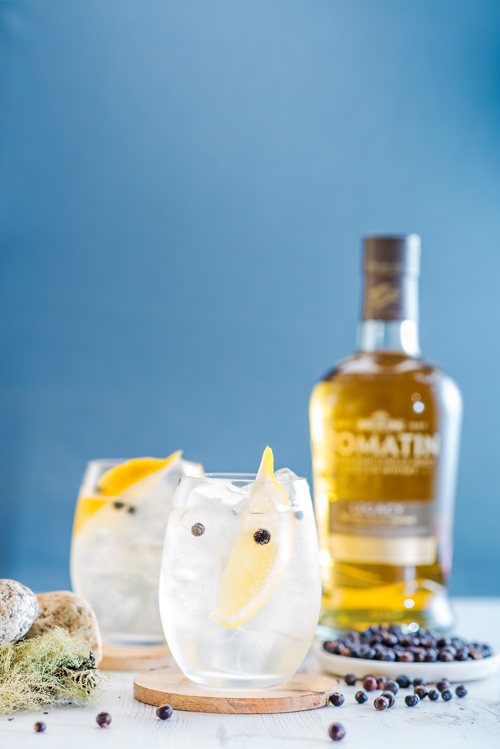 TOMATIN (MEANING THE HILL OF THE JUNIPER BUSH) LEGACY MAKES FOR A REFRESHING TWIST ON THE CLASSIC G & T.
Add Tomatin Legacy over ice in a stem-less wine glass before squeezing in the juice of a lemon wedge. Drop in some juniper berries then top with sparkling Indian tonic water. Garnish with a wedge of fresh lemon. 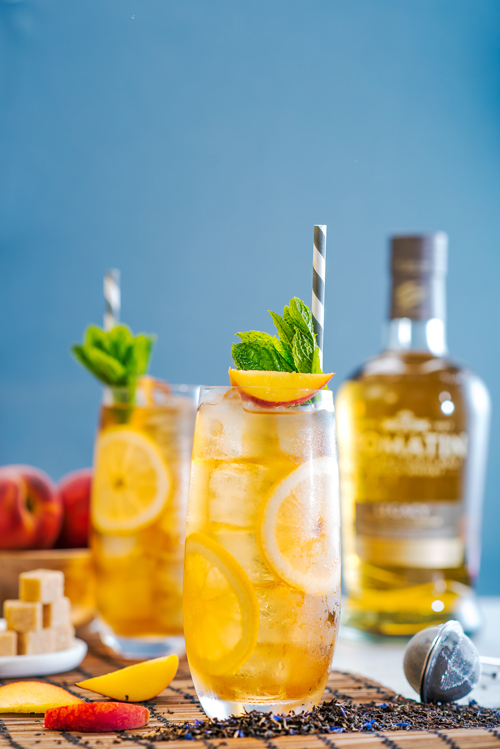 A COMBINATION OF TOMATIN LEGACY, CHILLED EARL GREY TEA AND CLEAR APPLE JUICE GIVES BIRTH TO A LONG COOLING DRINK. Pour Tomatin Legacy over ice in a Highball glass. Place 2 lemon wheels into the glass and then build with chilled Earl Grey tea, clear apple juice and a dash of peach bitters. Stir and garnish with a sprig of mint and fresh peach wedge. 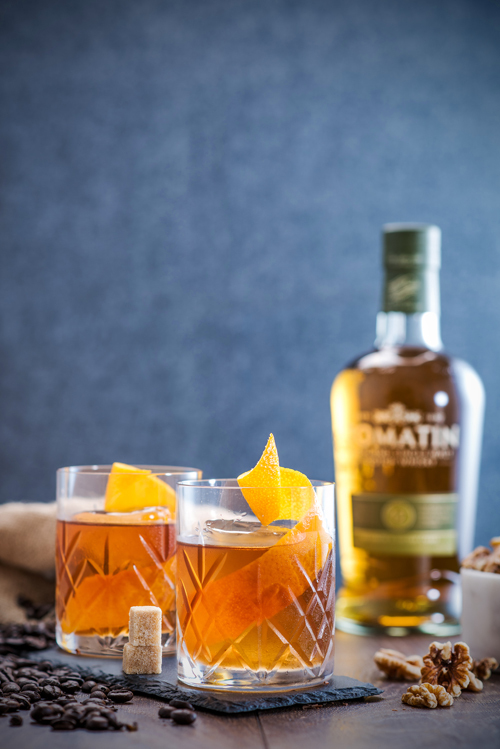 The citrusy tropical notes of Tomatin Legacy lends well in this punch style cocktail. 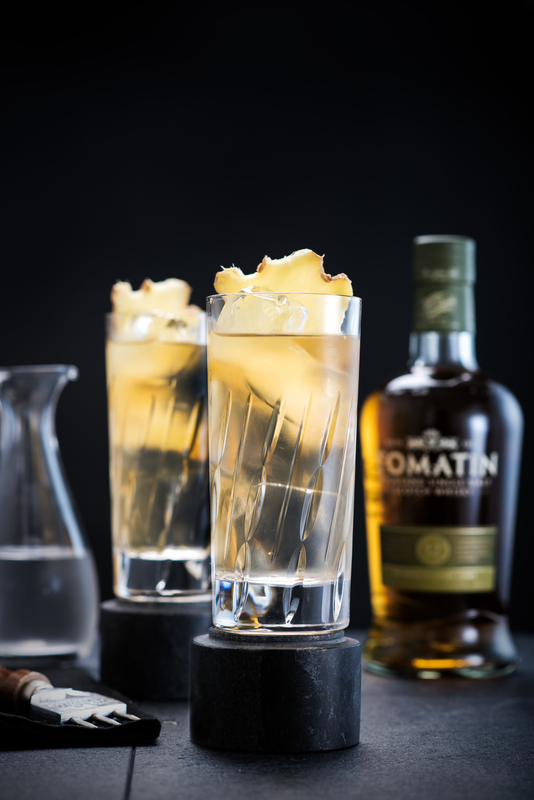 To reflect Tomatin’s softer side of the Highlands we’ve created a fresh twist on the classic Whisky Sour. break down the mint and chill the drink. Fine strain over crushed ice into an Old Fashioned glass. Finish with a red apple fan and mint sprig. Tomatin with more ice. Stir another 25 times or until the sugar granules have dissolved and the drink is sufficiently chilled. A beautifully crafted cocktail designed to reflect the magical Japanese cherry blossom season. Stir down a barspoon of cherry jam with Tomatin Legacy before adding coconut water and a small amount of orange blossom water. Shake vigorously and then double strain into a chilled Sours glass. Garnish with a maraschino cherry. A hybrid Scottish-Japanese cocktail sees the humble Whisky Mac serve combined with the elegant and stylish Mizuwari. Fill half a large chilled Highball glass with cubed ice and then add the Tomatin 12 Year Old. Stir several times before adding the further ingredients with more ice, and stir once again. Garnish with a slice of fresh ginger. For a zingy alternative swap the plum for ginger wine!